Shell size to 40 mm; flat or taking the shape of substrate. Septum relatively small, less than half length of shell. Color white inside and out; outside surface sometimes with thin, tan periostracum. 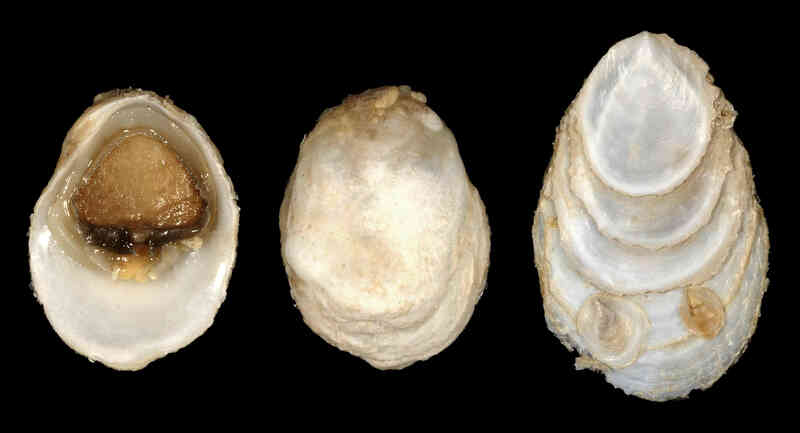 Although having a shell virtually indistinguishable from that of Crepidula depressa Say, 1822, C. atrasolea has blackish foot and direct development, whereas C. depressa has a white foot and is a planktotrophic species. The two specimens illustrated on left, part of lot BMSM 15002, are also part of the original material examined by Collin, 2000.